Sold Listing – 1626 Tollgate Court, Lebanon, Ohio 45036 – Move in Ready 3 Bedroom Home with Finished Lower Level! Gorgeous, meticulously maintained 3 bedroom home in Garfield Park! Updated flooring throughout! Spacious living room with wood burning fireplace and walkout to patio. Kitchen boasts stainless steel appliances and new granite counter tops. Finished lower level with family room and study or potential 4th bedroom. Move in ready! Must see! Minutes from downtown Lebanon, YMCA, and more! 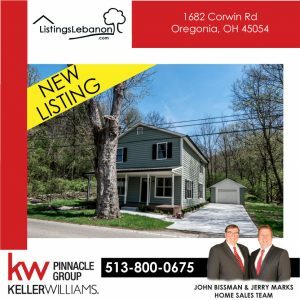 New Listing – 1682 Corwin Road, Oregonia, Ohio 45036 – Completely Renovated 3 Bedroom Home on Wooded Lot near Bike Trail and Little Miami River! Nature lover’s paradise! Bike ride right out your driveway to the Little Miami Bike Trail or take your kayak/canoe for a trip down the Little Miami. Completely updated 3 bedroom, 1.5 bath home on wooded lot. Over $150,000 in upgrades. Must see! Move in ready, and no HOA! Lebanon Schools! School District- Lebanon Ohio For more information visit Lebanon City Schools Website at http://www.lebanonschools.org/ The Lebanon City Schools district encompasses 5,800+ students. US News and World Report ranked Lebanon High School 48th out of all the public high schools in Ohio, while the Center for American Progress’ national study recognized the district for providing a high return for local tax dollars. Lebanon City Schools has six educational buildings: Lebanon High School Lebanon Junior High School Berry Intermediate School Donovan Elementary School Bowman Primary School Louisa Wright Early Childhood There are also plenty of other education options including Moeller High School, Fenwick, Lebanon Christian Schools Middletown Christian, Dayton Christian, Cincinnati Christian Schools. About Warren County, OH Located in southwest Ohio, Warren County is situated in the middle of the fast-growing Cincinnati-Dayton corridor. Warren County offers a variety of entertainment options and outdoor activities, including Kings Island, The Beach Waterpark, Great Wolf Lodge and the Lindner Family Tennis Center, Little Miami Bike Trails for both its visitors and more than 210,000 residents. Fueled by its rapid suburban growth, Warren County Ohio provides high-quality schools, healthcare and housing. 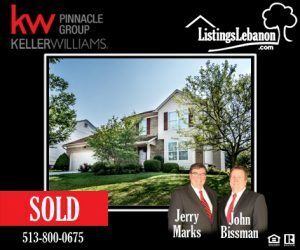 © 2019 Homes for Sale - Search for homes for sale in Lebanon Ohio 45036.